The classic a-line style is unique for its distinguishable graduations. The transition of shorter hair in the nape area to longer strands in front is smooth and classy. The short hair helps in pushing the longer hair on top and front sides to lend commendable volume. 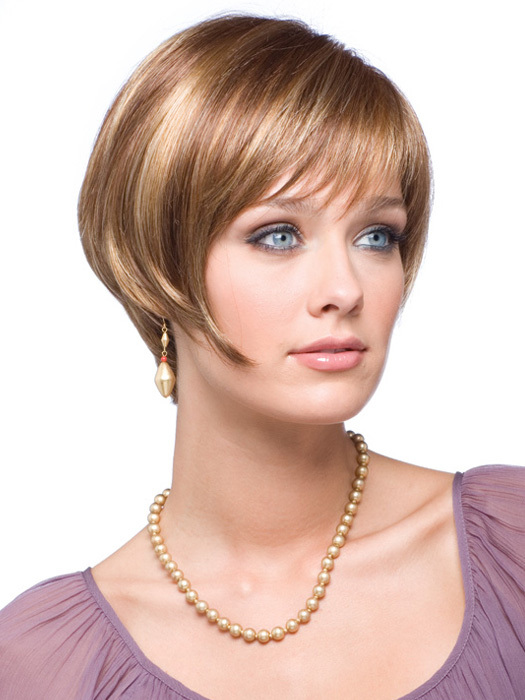 The style is soft and subtle with fine strands of longer tresses which accentuate the beauty of any face. A-line Bob (rear view) Short Hairstyles for Round Faces – Get it here! Wet hair using your favored styling product. Blow dry the hair lifting hair sections vertically off the scalp. Once dried, hold the individual sections still at the same angle utilized while blow drying and roll the hair using the round brush. Hold it in place for a few seconds and repeat with other sections as well. On completing with drying, set the hair with your preferred finishing spray. The graduated hair with volume on top and the tresses falling on the face makes the face appear elongated. 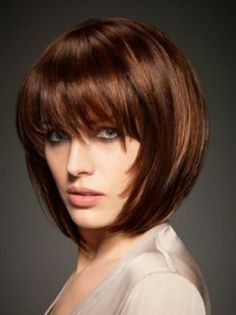 This unique bob style is fit for all face types and best suits fine to medium density hair. Bias Cut – Short Hairstyles for Round Faces – Get it here! Wear your hair in style at the top and side of your head sans a definite parting to give your face an unmistakably modern and stylish feel. The fluffed up and slightly casual appeal makes it ideally suited for any situation. Apply a styling product to your hair while wet. Blow dry the fringed areas in a side to side pattern to give it an even and characteristic look. Slowly dry the rest of the hair using your bare hands. Apply a texturing product to give it a distinct contoured feel. The shortened sides of the hairstyle make the face appear much less wider. Add to this the volume on top of the head which will make the face appear longer. The fringes partly cover the area thus making it look narrow and slim. An ideal hairdo for fine to dense hair and all faces except long ones. Combination Bob – Short Hairstyles for Round Faces – Get it here! This unique layered hairstyle assembled into a stacked bob has even perimeters right from back to front. The layers are gradually diminishing in length from front to back. The longer layers at the front help the volume of the hair to fall on the face naturally. Apply your preferred styling product to wet hair. Blow dry the nape area having the shorter layers of hair using flat wrapping routine (brushing hair in a single direction flat along the scalp). Using a round brush, blow dry the rest of the hair. Set it up with a quality finishing spray. The unique diminished layer feel adds a contoured feel to the face and hides the real width of the round face making it appear distinctly narrower. Fit enough for low to medium density hair of any texture to adapt this styling. The smooth transition of shorter back hair to the longer front end found in the classic a-line styling is absent in this trendy variation of the a-line. What sets it apart from its original counterpart is the lack of any transition which lends it a distinguished cool modern feel. Wet your hair applying your preferred styling product. Use a round brush to blow dry the hair. Smoothen and polish the longer strands of hair around the face using a flat iron. A lightweight shining product applied upon finishing gives best results. This hairstyle is ideally suited for round faces as the fringes apparently give an illusion of vertical elongation to the face. With more vertical angle in the fringes, the face would appear slimmer. Suitable for almost all face types, this style goes well with hair ranging from fine to medium density. 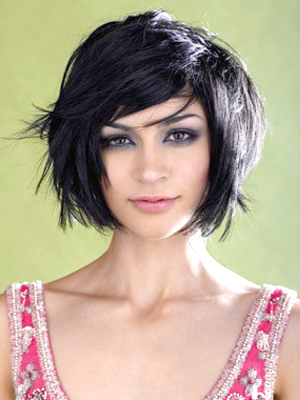 A variation of the much hyped pixie style, this hairstyle adds further remarkable features to the pixie’s sober looks. It is a fun way to add some texture to the pixie by styling the hair directed towards the face which gives the style a real edgy look. Unorthodox and trendy for the one who loves to stand out among the rest. Apply your favorite styling product to wet your hair. Blow dry the hair towards your face using your fingers. Applying any light texture product, dry your hair. Add detailing simply with your fingers to enhance the edgy feel. 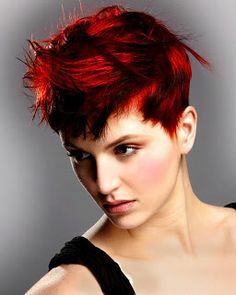 The edgy and messed up pixie on top adds volume above the head while the shorter sides make the face look apparently longer by diminishing the broader features. Any hair density and texture would feel good this funky hairstyle and add to your appeal. A casual short and shaggy version of the bob style, the edgy bob has numerous edgy layers and spiky bangs which give a special feel to the style. The perfect match of cut and length for round faces, this style cuts in exactly at the jaw line which gives an absolutely flattering feel. Simply out of the box and trendy. Blow dry the bangs in the downward direction while styling the rest of the hair forward directed towards the face. Take sections of your hair and smoothen out with flat iron. Add details further using the iron. Add some cool texture to your tresses using your preferred styling product. The spiky layers and bangs add a definite distinguished feel to the style. The bangs especially accentuate beauty by complimenting the facial features pretty well. The style is suited for hair of all densities. Soft, cute and stylish, this hairstyle with delicate side bangs accentuate the beauty of any face especially one with broad features. The stepped layers with graduation from shorter beneath to longer on top add natural volume to the top of the head. The touch of winged feel with its delicate features is the highlight of this style. Towel dry wet hair after a shower and use your preferred product to add volume to your tresses. Comb through well enough. Blow dry your hair with the bangs in front beside the face and the rest volume directed back. Manually add extra volume using a round brush. Before ending blow dry the hair and flip out the bang ends using the round brush to add an element of flirty fun to the style. The side bangs and curled flips add extra features to the contours of the face which gives an apparent feeling of elongation to the face especially with some volume on top. It is best suited for hair with fine to medium density. Elegant and neat yet undoubtedly natural in feel, you will love this style if you love to flaunt your tresses worn on the sides of your head. An asymmetric parted look and the hair drooping stylishly on the sides gives a natural feel of effortlessness. A color contrast on the two sides of the parted hair would act wonders for the look. Use your preferred styling product to wet your hair. Blow dry hair entirely to one side with styling brush. Keep it tight and flat against the head. Repeat the process but in the reverse direction. This method of flat wrapping dries the hair and makes it smooth simultaneously. Using a flat iron, polish the longer side and finish off styling with your preferred finishing spray. Your tresses falling on one side of your face partially hide the broader features, making the face appear narrower. Any hair texture and density can effortlessly take to this style with élan. A super cool variation of the widely favored pixie, this hairstyle gives your face a touch of unmistakable grunge and glam. The hair styled up and assembled at the top in a casual way much like a rocker babe would do, the fluffed appearance on the top adds wonders to diminish the broader features of a face. Blow dry hair lifting it on top of your head to create volume. Use a cream or wax to style the hair on top pointing upwards and centered in a fluffed pattern. Style the hair at the sides and back flat on the head. Add finishing spray to get that extra hold. Among the best styles for the round face, this hairstyle adds the illusion of vertical length to your head thanks to the added volume on top. Fine to medium texture and density of hair is best suited for carry this style. Arguably the best bob style that can get effortlessly with any face type. This style casts itself in sync with the wearer’s bone structure as the short to long transition angle is always parallel to the jaw line. 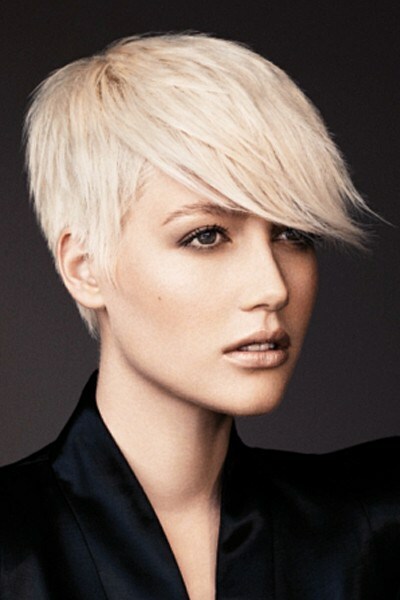 A gradient feel in this style gives a natural feel of volume which makes the hair appear dense as well a thicker. Wet your hair using your preferred styling product. Blow dry using a styling brush. Use a flat iron to smoothen the hair. Apply any lightweight shining product on finishing for best results. The hair naturally falls on the face with helps in covering the sides of the face with relative ease. This makes the face appear narrower and gives the illusion of it being longer than it actually is in reality. Ideal for the round face, it suits well on fine to dense hair.